A rat is a medium-sized rodent found on all inhabited continents. They live on garbage in slums and are also often known to carry disease. The bubonic plague which killed one third of the population of Europe is attributed to rats which carried plague-infected fleas living in their fur. The genus Rattus includes over 50 species. 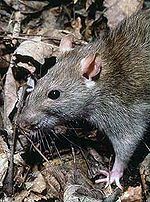 Rats are capable of surviving in a wide range of different environments ranging from grasslands, forests, urban settlements, ships, and the unforgiving arctic. They tend to thrive around human beings. Rats can survive on an extremely diverse diet, including seeds, fruits, small birds and mammals, scraps and even garbage. Scientific laboratories frequently use rats for studies of behavioral psychology, as well as the effects of drugs or radiation. Rats can be kept as pets, although it is unwise for a child to try to tame a wild rat found in a slum. Like gerbils and hamsters, they must be raised in a sterile environment before being brought into your home, lest an accidental bite infect you with a deadly disease. They are usually kept in a cage or a terrarium, sometimes with other rats or mice. Domestic rats are curious, clean, and gentle creatures with a lifespan of approximately three years. This page was last modified on 9 April 2019, at 15:04.